THEY may scream for ice cream in Paducah, Peoria and Pittsburgh, but here in the City of Quakers and its environs, water ice satisfies that summertime craving for something sweet and cold. As 17-year-old South Philly resident Brooke White insisted so simply yet eloquently during a recent visit to John's Water Ice, at 7th and Christian Streets, the frozen concoction is "the best thing in the world." 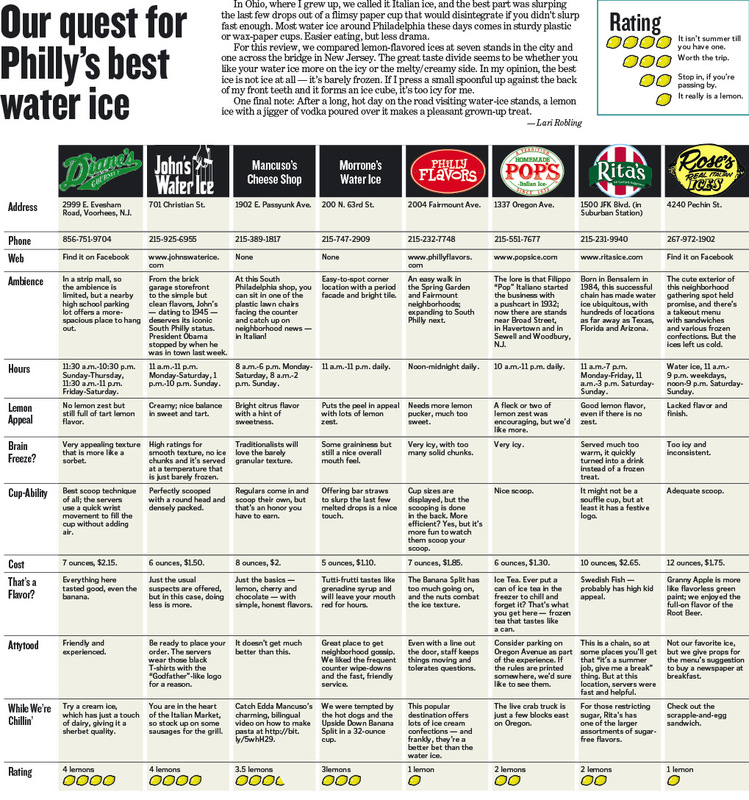 While that assessment is surely open to debate, there's no denying water ice is as much a part of our region's culinary DNA as hoagies and cheesesteaks, despite it not having received the same level of publicity those two edible icons have. We're taking steps today to correct that inequity. Turn the page to find out everything you need to know about your fave summer treat - its history, how it's made, whether it's good for you, its expanding national profile and how to use it in an adult beverage. We also rate eight area water ice stands. "A cold slice of heaven." That's how South Philly resident Mike Yampolski responded when asked to describe water ice during a recent visit to John's in South Philly. That poetic phrase is immediately understood by those of us for whom the treat is a key ingredient in our culinary experience. But it doesn't seem particularly helpful in describing water ice to the unenlightened masses beyond the Delaware Valley's boundaries. Water ice is easy to love, but explaining what it is to the unfamiliar is anything but simple. Most Philadelphians speak in terms of what it isn't when they try - no, it's not ice cream . . . or a snow cone . . .
"It's like a chopped Popsicle," offered Brooke White during a recent John's run. Her mom, Theresa added an appropriate, but still vague, "It's light and flavorful and chunky." When Old City's Jennifer Mantiti finds herself talking water ice with the uninitiated, she defines it in terms of "the Italian ice you buy in the supermarket - but better, because it's not frozen solid." Digging into a chocolate water ice - her first - Alyssa Zanone of Athens, Ga., called it "the perfect light refreshment for the summertime." Nice. But still ducking the question - what is it? Since it's neither water nor ice, after all. According to Anthony Cardullo, the third-generation owner of John's Water Ice, his product is, simply, "all natural fruit juice, sugar and [frozen] water." This sum-of-its-parts approach still doesn't do water ice justice, but coming from an authority on the subject, it's likely the best description we'll get for this unique frozen snack that is a much a part of summer in our little corner of the universe as the Phillies, Shore vacations and unbearable humidity. Was a Nero the hero? The origins of water ice are lost in the misty ice chips of time. But two competing theories endure. One suggests that spaghetti wasn't the only Chinese delicacy Italian explorer Marco Polo brought back from his Far East sojourns during the Middle Ages. "Roman emperor Nero Claudius Caesar . . . often sent his servants up into the mountains to chill his various wines. One day a servant accidentally mixed the chemical saltpeter in with the mountain snow, thus causing the quick freezing effect necessary in the preparation of water-ice." Either way, Philly's infatuation with the stuff definitely can be traced to the great wave of Italian immigration in the late 19th and early 20th centuries. The new residents began selling "Italian ice" out of their homes or from street-corner stands. John's Water Ice, the South Philly institution, was started by owner Anthony Cardullo's grandfather, a Sicilian, in 1945. John's gained national fame last Thursday when President Obama and his entourage made a spur-of-the-moment stop there during a fundraising visit to the city. Unfortunately, it appears impossible to determine when Philadelphians began calling Italian ice water ice. But the curiously meaningless name - isn't all ice made from water? - is definitely indigenous to this region. The rest of the nation is more familiar with the term "Italian ice." At stands owned and operated by Trevose-based Rita's Italian Ice and its franchisees, the process of making water ice begins with water - but not as an ingredient. Before a new batch is started (Rita's ices are made on site at each outlet), the specially designed machines that freeze and blend the ingredients are flushed with water to clean out remnants of the previous batch. The appropriate syrup and sugar are measured. Water is loaded into the machine, followed by sugar, then the syrup. Refrigeration and blade ("dasher") systems are activated to mix and chill. At that point, such things as real fruit slices may be added. It takes about 30 to 45 minutes to make a batch, depending on flavor and desired consistency. After it's done, the water ice is hand-stirred every 30 minutes to maintain its creamy consistency. Standard water ice contains little or no cholesterol or fat. But its sugar content makes up for that. Specific totals vary by flavor but, according to myfitnesspal.com, one regular cup of Rita's mango (the chain's top-selling flavor) contains 240 calories and a whopping 65 grams of carbs (300 grams is the daily recommended allowance). Put another way, that's roughly 16 teaspoons of sugar. According to livestrong.com, 240 calories and 65 grams of carbs are exactly what's found in a 20-ounce bottle of Coca-Cola. If water ice were a religion, Barb Knight and Jim Moy would be its missionaries. They have traveled to godforsaken parts of the world (from a Philadelphia perspective, anyway) and spend their days preaching the gospel of our fair city's indigenous frozen treat in hopes of saving heathen palates from the spiritual enslavement of slushies and "sno cones." Knight owns and operates a Rita's franchise in the Phoenix suburb of Glendale, Ariz. Moy uplifts the dessert-challenged denizens of Austin, Texas, via his small chain of Jim-Jim's outlets. Moy, who grew up in Roxborough, had his epiphany in 1993 when a friend from Texas visited and they headed down to South Philly for some water ice. Savoring his scoop of lemon, the friend commented that he wished water ice was available in Texas. "The lightbulb went on in my head," Moy recalled. Not that getting started was easy. There was, for example, the language barrier. Moy said that when he went to Austin City Hall to get the necessary permits, a clerk asked him what his business would sell. He replied in his best Roxborough accent, "Wooder ice." "Excuse me?" the clerk replied. "Is it a wood and ice business?" Not surprisingly, that name "water ice" has proven to be a persistent hurdle. "It still is a big education problem," said Moy. "[Philadelphians] take the name for granted, but down here, it's a contradiction in terms. [My customers] don't even call it water ice. They call it 'Jim-Jim' - 'Let me have a mango Jim-Jim.' "
As for how he enlightens those who grew up in the wilderness of second-rate frozen snacks, Moy has found that actions - such as coupons for free samples - speak louder than words. "It's hard when you try to describe water ice," he reasoned. "It's better to give them something tangible so they can taste it." Compared with Moy, Glendale-based Knight is a novice of the water ice crusade, having opened her Rita's outlet on April 6. Born in Northeast Philadelphia, she was raised in Pittsburgh but spent childhood summers at her grandparents' Rhawnhurst home. That's where she experienced her conversion to water ice devotee. So far, Knight's business has been buoyed by what she described as a surprising number of expat Philadelphians now living among the cacti and coyote who "drive past and recognize the [Rita's] logo." Like Moy, Knight has navigated some culture clashes. "Down here," she explained, "they actually have water-and-ice stores that sell water and ice." It doesn't take an Iron Chef to realize that Philly water ice would make a great ingredient in an adult beverage perfectly suited to this time of year. Of course you could just throw a slug of vodka or rum into a cup of your favorite flavor. Or you could get a little more creative. The Saloon in South Philly offers the John's Water Ice Martini, which blends lemon water ice with limoncello, the lemon-flavored Italian liqueur, and Absolut Citron vodka. Mad River in Old City offers specialty cocktails at its Tiki bar using John's lemon and pineapple water ice flavors. In Northern Liberties, Chenango Restaurant and Bar serves up a frozen variation on the Hawaiian Mai Tai that combines passion fruit, orange and an ounce of Myers's Dark Rum with guava-flavored water ice.